Launching a new product requires the collaboration of several teams, each bringing their own expertise and particular skill set to ensure that launch, delivery and service all function perfectly. Westport’s service team has been a crucial part of the launch of the Westport iCE PACK™ LNG Tank System. Before a product launches, the service team ensures customers will have a seamless and positive experience as they drive with a new liquefied natural gas fuel system. Product service is a key consideration during product development. A customer care plan is created by field service, warranty and service engineering staff, and released prior to product launch. Service engineers work with a wide variety of other engineering teams throughout product development. Westport’s iCE PACK service engineers work with their counterparts in controls, cryogenics, and vehicle integration teams. The customer care plan includes training development, with onsite visits to both the dealer and the customer. Westport field service representatives visit the customer site, train them and also often include an original equipment manufacturer (OEM) representative before day one on the road. Steve Froese, a Westport Service Engineer, installs an integrated gas module as part of the Westport iCE PACK LNG Tank System. 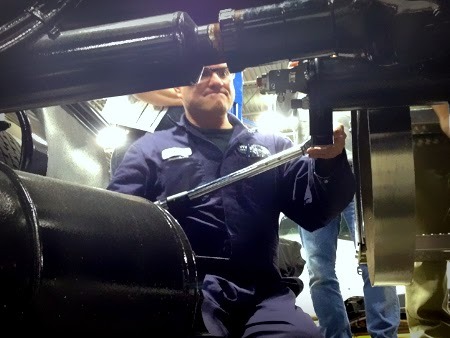 Customer training includes teaching the driver what to look for during daily pre-trip inspections relating to the basic operation of the truck and the natural gas fuel system. The pre-trip includes visual inspections of key components, fluid level checks, and monitoring the on-board gas detection system. The service team operates an online service support portal, and a hotline where a Westport representative can be reached 24 hours a day, seven days a week for customers and dealers. Ongoing support ranges from in-person technical support visits to maintenance and repair advice. Westport service representatives are located across North America, to provide the highest level of service to iCE PACK customers. “We always have the customer in mind with our service efforts as we want to make sure the product performs as the customer would expect,” Bryan says.